Born in 1972 in Aguadilla, Puerto Rico, Delgado was signed as an amateur free agent by the Blue Jays in 1988. After beginning his professional career as a catcher followed by a short stint as an outfielder, he was moved to first base and evolved into the most productive offensive player in franchise history. On his way up to the big leagues, the left-handed-hitting slugger collected MVP Awards in the Class-A Florida State League (1992) and Double-A Southern League (1993), before receiving his first big league call-up at the end of the 1993 campaign. 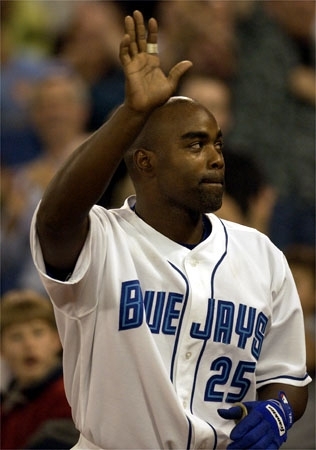 Delgado became a regular with the Blue Jays in 1996 and would star with the club for the next nine seasons. During that stretch, he had eight consecutive, 30-home run campaigns, was selected to two all-star games (2000, 2003), won three Silver Slugger Awards (1999, 2000, 2003), a Hank Aaron Award (2000) and was named The Sporting News Major League Player of the Year (2000). He also finished second to Alex Rodriguez in the American League MVP voting in 2003. Not only did Delgado lead the Blue Jays in numerous offensive categories, he also topped the American League in doubles (57) and total bases (378) in 2000 and in RBI (145) and on-base plus slugging percentage (1.019) in 2003. On September 25 of that same year, he also became the first Blue Jay – and 15th player in major league history – to belt four home runs in a game. While suiting up for the Blue Jays, Delgado rewrote much of the club’s record book and is the team’s all-time leader in several statistical categories, including home runs (336), RBI (1,058), doubles (343), runs (889), total bases (2,786), slugging percentage (.556), extra-base hits (690) and walks (827). He also ranks second all-time amongst Blue Jays in on-base percentage (.392) and games (1,423). For his efforts, he was added to the Blue Jays Level of Excellence in 2013. After leaving the Jays following the 2004 season, Delgado extended his string of consecutive 30-home run seasons to 10 with the Florida Marlins and New York Mets. He finished his career with 473 home runs (31st all-time) and 1,512 RBI (52nd all-time) in 17 big league seasons. Off the field, Delgado was very active in charitable endeavors. In 2001, he formed a non-profit organization called “Extra Bases” to assist youth and underfunded services in Puerto Rico. While in Toronto, he supported several charities, including the Special Olympics and Easter Seals. In 2006, he was honoured with Major League Baseball’s Roberto Clemente Award, which is given out annually to the player who best exemplifies humanitarianism and sportsmanship.